Always, have the clear demarcation between dependency and receiving. When one affirms that they are independent, that is next to impossible. As we all are social beings, co-existence, co-creating, depending or taking help from one another is a necessity and is natural. It is the way of life. To have a support system that is desirable i.e. one where the needs are met and also promotes you in your growth, is awesome ………Receiving is a privilege. So affirm for that. In blocking the receiving in aid of being independent is a mis-understanding. This has to be a mutually beneficial association. This entry was posted in Uncategorized on July 30, 2015 by IAD Life. When you participate in the process of de-cluttering please pay attention to some instructions. Please feel free to cry and please keep yourself hydrated (keep your drinking water close by, keep sipping). This is a workshop, where you need to vent out the deepest, darkest thoughts and be open as much as you possibly can. Go deep, go horizontal and vertical and but recognise what are these, that you no longer need. If you cannot speak out in front of others, do it in front of the mirror. Use IAD Life mirrors as they are heart shaped so they will keep reminding you to be loving. In this workshop you will let out a lot of toxins, give yourself permission to set an intention that you will clear off all that is no longer required. That you will do by first recognising what needs to be cleared and then how that needs to be cleared. Definition of de-clutter. Clutter is something that is causing cloudiness or murkiness, obstructing what needs to be clearly seen. Clutter is thus, something that you may not need and could happily let go. Other definitions that we got were, getting rid of, welcoming new, making space for what is desired. So the first step is the most gigantic, cumbersome step to recognise and remove, what is required to be removed. Removal are of many types, it is based on the pros cons weighing and can be transformed. You could decide to have a different perspective of the a clutter, thus making it useful by just changing one’s mind set about it. De cluttering is our assistance of your journey from “poison to FOISON” (dictionary meaning). Poison is ‘a substance with an inherent property that tends to destroy life or impair health’. Foison is ‘abundance’. Important, is how and what to recognise, that needs to be corrected and changed that needs to be de-cluttered. So we choose an area/s then comes the bigger question, what needs to be de-cluttered. How, is you could use Tapping (EFT), Mirror Work, Angelic Guidance, Breathing (notice what surfaces from the top of your mind), pay attention to your Intuition, and also by observations around. While choosing the area/s to start de-cluttering, there are sometimes a bit of a confusion as to which one to start with. It’s when you start with one area, it takes you from one area to another and the actual area that needs priority in de-clutter. In case of physical objects, you could decide to change the structure or the placement and then the clutter is useful again. Take, toss or give away. Start from one side, one portion. Do a part of de-cluttering regularly. while you are doing this, you could affirm, “I am clearing the closets of my mind”, notice what good things that are to follow, and acknowledge. Please note we do not have to completely expel people from our lives. What is the clutter here, is “the habits and attributes and characteristics” that are no longer in need and thus are bothering us, or is no longer fun. When and how to decide that it is so, when one starts to feel suffocated/uncomfortable by it. That very moment one needs to retrospectively introspect. Work on leaving them behind or letting go. That happens by way of recognising what these are, then make a list and find out where are you “these” with whom, including yourself. Understanding these “the habits and attributes and characteristics” are important as these are our learning, through teachers, the people/relationships, that carry our learning, and if we don’t learn then it keeps getting carried over as “patterns”. I had once read, people/relationships are there in our life for a reason, season or a life time. Ones that are for a reason or season, learn the learning and let go, one that is for a life time is worth a detailed study. You de clutter, Anger, Un-forgiveness, Patterns, Guilt, Fear, Blockages, Resistance etc. Thank the job, thank the advantages from the Job in hand or thank the situation or time that is available because you have yet to have one. Thank the building , the people, the things, increase your skill sets, be flexible in the job requirement, get clarity on what you truly want, time in thinking how much or what to want and which direction to go, take professional help. How often do you exercise, What is your desired way of exercising – have you given that a thought, How often do you watch what you eat, How often do you sleep on time, What are your sleep patterns, What are you thinking when you are cooking and eating. Bless your food. Water and food has memory. Meditation, water intake, how much do you love your body, how many times have you told your body that you are grateful or you love it. What thoughts are working for you, Which ones are too much to handle. Decide which ones to take, toss or to transform. Please know that beliefs and thoughts are game of convenience, decision is all yours. What does not work for you take help from angels and start cutting the Cords. Use Pranic Healing to clear the energies that are low and to energise and add higher energies. Your clutter can be recognised by only you. When there is more than one person deciding for an ‘object’, to one it may seem fine or something that can be decided upon later, while you think it can go now. In these situations, it is better to look within. Possibly, you need to de-clutter “lack of self-approval”, and so on. Rashmi Harish: Biggest realization about this workshop was “self love is always main ingredient and what we experience/ what comes along is like cherry on the cake”. Being a mommy to be, it was difficult for me to accept and take the responsibility. But I realized it’s a blessing and I have abundance in form of baby 🙂 being a mom is not a break for everything but a new start for all with a life long companion. I would thank IADLife for extending the support and making me understand and feel the happiness so that I can enjoy my pregnancy now. Daisy Ibraham : De – clutter my life part I had many aha moments for me. From seemingly simple statements like ‘I want to declutter my home’, very insightful revelations about my life had been drawn. The experience brought forgiveness in relationships gave tools to move forward and tips to declutter.The step by step personal guidance was very enriching and enlightening.The pointed questions Reena had put in helped reach the right places of my unconscious mind and helped me understand myself better.Thank you Reena.You are awesome. 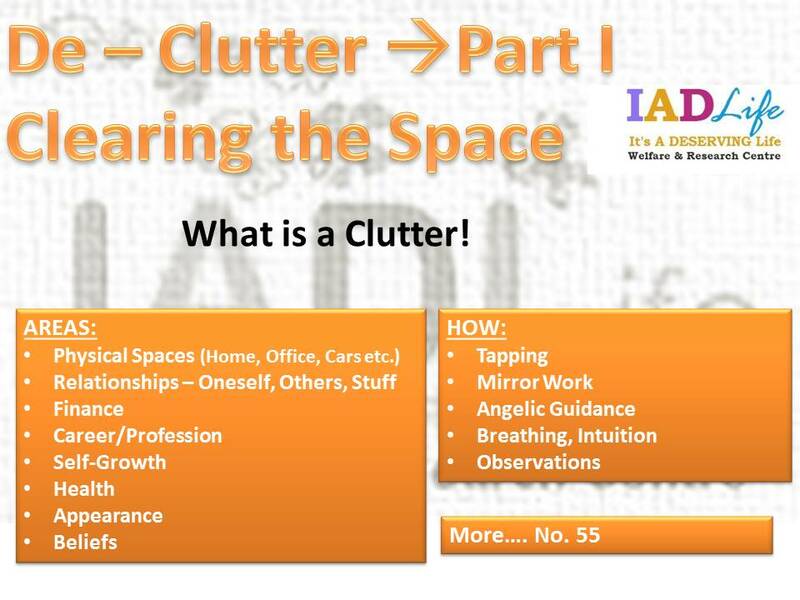 PriyaShree : This was the third time I attended De-cluttering workshop conducted by IADLife. Though it was the same workshop, I had a very different experience in all the three and a set of new learnings each time. First time when I attended, I made a vision board in which I wanted to manifest a Samsung Galaxy S4 i9500 mobile. Amazingly I got it on the third day after I completed my vision board. Second time also I was able to manifest most of the wishes from the vision board. 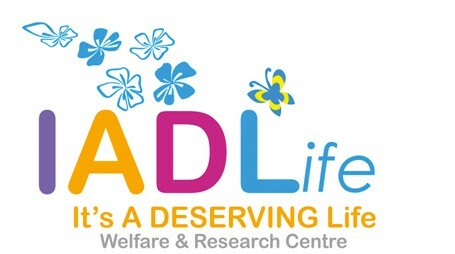 Thank you Reena Yadav and IADLife for conducting such wonderful workshops, to make my life really awesome, fun and amazing. This entry was posted in Uncategorized on July 20, 2015 by IAD Life.